Perhaps you were expecting Tokyo’s pop culture, architecture or throngs of work hard play hard businessmen in grey and blue suits on the metro during rush hour. All are iconic but what stood out most to me was utilitarian, but with a uniquely Japanese flare for gizmos and design. You’ll find them in every neighborhood and even under the city on metro platforms. 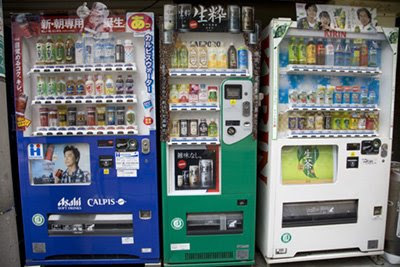 According to some statistics there are approximately 6 million vending machines in Japan. Tokyo is home to about 2.4 million. Most sell energy and soft drinks, hot tea and coffee, beer, saki and cigarettes. You can also purchase anything from umbrellas to razors. In Tokyo vending machines cater to the lifestyle of city dwellers that are constantly on the go and live in small spaces. For these urbanites buying in bulk is not a practical option. Convenience isn’t overly pricey. A soft drink will set you back about 120 yen, which is about $1.10. The machines do not fall victim to vandalism, graffiti or theft, which would be unheard of in other major cities. Georgia coffee - light brown can - hope it's still 110 Yen. My staple! I lived and died by those green tea bottles....mmmmmmmmmmm no sugar though b/c with sugar they were too sweet! The vending machines were definitely a highlight for me in Japan (simple pleasures). It was also the first real time I started to pay attention to product design- so cool! -Sheila-Coffee drinkers of the world unite! -Lakshmi-glad you find it interesting. -Matt-I'm with you on the no sugar. -Anne-I'm a huge fan of Japanese design in general. Looks like the Green Tea is a hit! 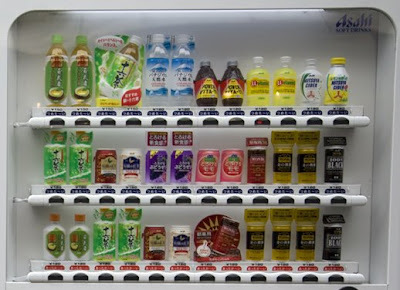 the vending machines look very cool...just one of many things I'd like to try out in Japan! I bet you'd love it.